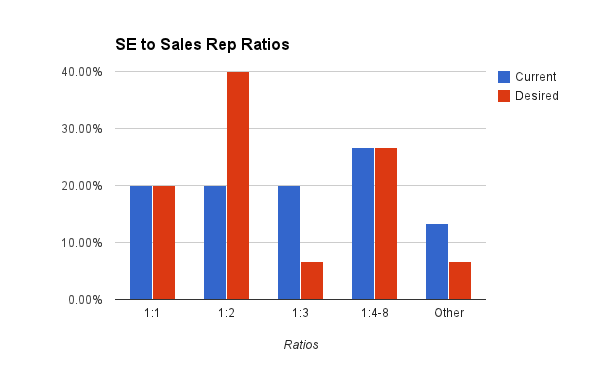 Recently we had a survey to check how many SEs the average sales team has in relation to the (non-SE) salespeople. I had a lot of feedback from the field and am now making it available as some early feedback. One thing I didn't consider that some companies may have more SEs than Salespeople. Other was relatively small, but a very interesting category. I'd love to hear what the people who used other meant. The responses were weighted by company. So companies with more SEs responding still get one vote. SEs want a lower ratio. This would allow SEs to build a working relationship with a lower number of reps, and mean less time juggling responsibilities with different people. The grouping of responses in the 1:4-8 category was because I didn't expect many responses. Next time I would give more options and split this category. 1:3 like a very undesirable ratio, however 1:4-8 seems to be reasonable to those with this ratio. I would like to discuss this more widely, in the meantime if you'd still like your voice heard - the form is still open! It seems odd to me that 1:3 is the least desire-able. Maybe its because once an SE gets to 1:4 and beyond, economies of scale kick in? 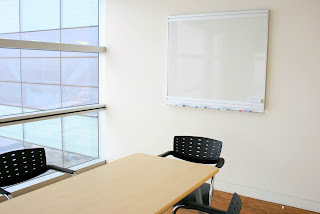 Standardized demos, Decks, more capable Sales people etc? At my current company we have a 1:2 ratio for the most part with a few exceptions but we also have Specialists for the different technologies we sell which helps spread the load. It also enables our core SE's to become more generalists with a few specialties rather than trying to be specialists at everything. How many responses did you get or how many companies did you survey ? ?